A delicious way to bottle the goodness from all these berries is to make a syrup. 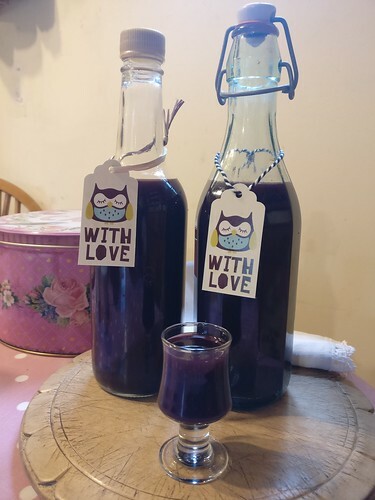 Traditionally, it is made with elderberries and rosehips and falls into the medicinal category of syrups to fight Winter colds and viruses as the berries are rich in Vitamin C. I make mine with elderberries and rosehips as the main ingredients but I also add sloes and haws. 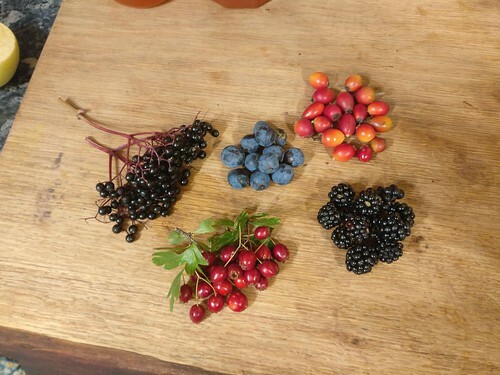 Altogether, I aim to have 1 kg of berries, which I add to 3 litres of boiling water. Elderberries (picked off their stalks) and sloes go in whole and I mash the haws and the rosehips beforehand (chopping them in a food processor). I also add a piece of fresh ginger and one cinnamon stick into the pan. I bring this to the boil again for a few minutes then I let it cool down and infuse for around half an hour. I then pour the whole lot into a straining bag until all the juice has come down, usually overnight. When that’s done, I add 500 g of dark brown sugar and a teaspoon of ground cinnamon to the pan of strained liquid and I let that simmer for about 5 minutes. I then pour it into sterilised bottles, label them and place in the pantry when they have cooled down completely. 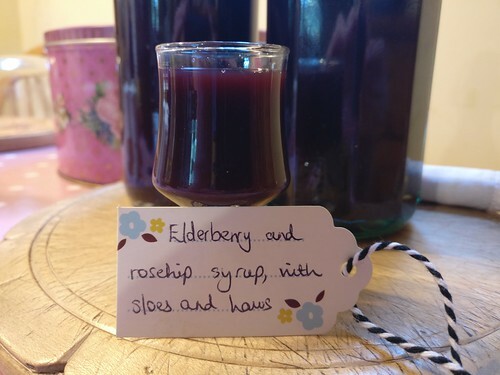 A really tasty, warming syrup – good to eat as is for medicinal aims or mixed with yogurt, ice cream, porridge etc. It is also delicious added to mulled wine.